Disclaimer: Annette Key was a former executive video editor at the Daily. Key was not involved in the writing or editing of this article. The Tufts women’s club ski team ended its historic season with an eighth-place finish in the Alpine Ladies division at the United States Collegiate Ski and Snowboard Association (USCSA) National Championship in Jackson Hole, Wyo. College teams from across the nation, including both club and varsity programs, gathered in Jackson Hole to compete in men’s and women’s nordic, freeski and alpine skiing events as well as men’s and women’s snowboarding. The Tufts women’s ski team raced in the women’s giant slalom (GS) and women’s slalom on Tuesday, March 12 and Thursday, March 14, respectively. Junior captain Sami Rubin, junior Olivia Wentzell, sophomore Annette Key, first-year Pippa Hodgkins and senior Taylor Hart composed the team representing Tufts at Jackson Hole. Although this was the first time in program history that a Tufts team qualified for nationals, Rubin attended nationals in 2017 as an individual competitor. While a team needs to place within the top five in their USCSA region in order to qualify for nationals, the fastest competitor from a non-qualifying team can be eligible as an individual. From Rubin’s perspective, competing with a team was far better than competing alone. In the GS race, Tufts finished ninth out of a group of 21 teams with a combined time of 6:41.65. The team carried its momentum from the GS race into the slalom race two days later, where it placed eighth with a combined time of 5:50.45. Unlike the men’s team, which does not have a clear preference between slalom and GS, slalom is widely considered to be the women’s strongest event, according to coach Brent Talbott. Entering the slalom race, Rubin explained the team had high expectations for their performance. Rubin explained that the Jackson Hole slalom course was slightly faster than the team had expected, which challenged the team to push its limits. While the team had anticipated a faster combined score, it was content with its eighth place finish. “It was nice having slalom be the last race of the year because we were able to work all year on being calm and channeling our nerves,” Rubin said. In the individual event, Rubin led the pack with a seventh place finish in the slalom race, posting an impressive combined time of 1:46.68 between her two runs. Competing at nationals forced the team to make adjustments to their style of competition. According to Rubin, the snow at Jackson Hole was softer than the icy snow on the east coast, and facing new competitors out west was both exciting and intimidating. The entire competition was live streamed, which meant that the group’s friends, family and teammates were able to watch the team perform. Despite the unfamiliar environment, the team was able to rise to the occasion and have an incredible time in the process. “It was really cool being out west and being able to reach this thing that we’ve been working towards all season,” Rubin said. Talbott was also proud of the team’s performance at nationals. 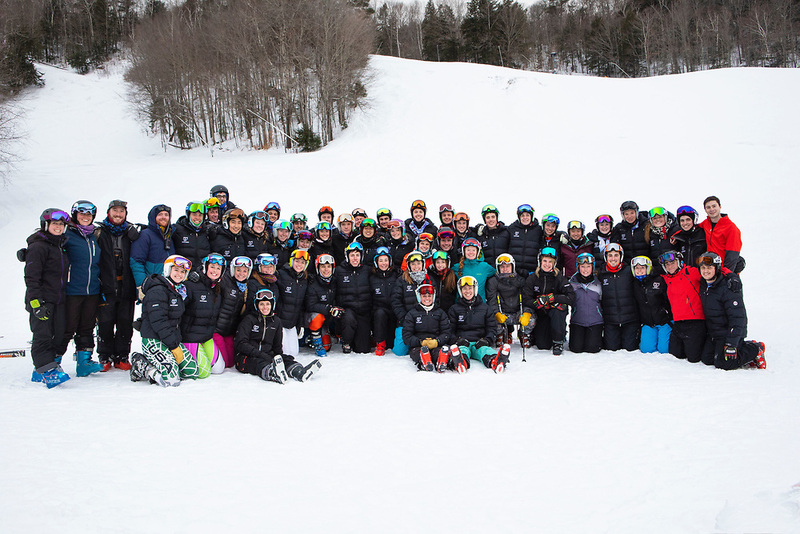 The team’s eighth place finish cemented Tufts’ reputation as a top-notch skiing program within the USCSA, and established a precedent for sending future teams to nationals. Moving forward, Talbott has lofty goals for the program. Talbott — who believes the program is stronger now than ever before during his three-season tenure — hopes to see the women’s team finish within the top five at nationals next season. As the head coach of an 82-person team, Talbott believes that the team’s unique combination of talent and sportsmanship is the secret to the team’s success.